THANK YOU to our Event Sponsor North Dakota Department of Commerce! Marci Narum is a TV news anchor-turned entrepreneur. After 21 years in front of the camera, she signed off in 2014 to begin delivering another kind of news: words of encouragement and hope for positive life change. As a speaker, Narum inspires and entertains audiences with her stories and messages from her own experiences. She also coaches growth-minded individuals and teams. Narum is a Gallup-certified Strengths coach and certified Leadership coach with the John Maxwell Team. Her mission is to help others cultivate confidence, maximize their leadership, and build and sustain strong teams by developing stronger individuals. Narum is a North Dakota farm girl raised on a dairy farm near Douglas. She graduated from Garrison High School in 1989 and holds a BA in Broadcasting from Minot State University. Narum is a member of the Bismarck-Mandan Chamber of Commerce. She volunteers in a variety of ways throughout the community, and serves on boards and committees, including the Northland Regional Thrivent board, Central Dakota Children’s Choir board, and the Women’s Health Conference of Bismarck. She is also the co-editor of Inspired Woman magazine. Narum lives in Mandan with her husband, Jim Silrum, and their two miniature dachshunds, Mickey and Sophie. Betsy Dalrymple became First Lady of the state of North Dakota on December 7, 2010, when Governor Jack Dalrymple was sworn in as North Dakota’s 32nd Governor. She immediately set out to work for the people of North Dakota and advance her long career of public service, with special emphasis on early childhood education and volunteerism. 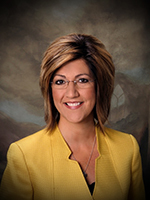 As First Lady, Betsy’s priorities include: expanding Dolly Parton’s Imagination Library across the state; promoting her book “Building a House, Making a Home: A History of the North Dakota Governor’s Residence”; serving as chair of the North Dakota Cares Coalition, and; chairing the task force on civics education legislation. Betsy grew up near Detroit, Michigan, and earned a bachelor’s degree in developmental psychology and teaching from Briarcliff College in New York. She worked as an elementary school teacher in Fargo, before devoting time to her children as a stay-at-home mom. 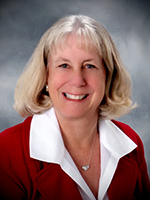 As an active community member, Betsy has served on the Casselton School Board, the State Board of Public School Education, and the Fargo-Moorhead Area Foundation. She has also been involved with the Fargo-Moorhead Junior League, Red River Human Services Foundation and the North Dakota Protection & Advocacy Project. Betsy was awarded: the Children’s Champion Award by the North Dakota Association for the Education of Young Children in 2011; the Ready Child Community-Based Award of Excellence by the North Dakota Education Association in 2012, and; the Love Without Fear Award by the Abused Adult Resource Center in 2014. The Governor and First Lady were married in 1971, and they have four daughters. Tracy comes from an entrepreneurial family, and she was raised on the phrase, “You’ll never know unless you try.” Her family started Papa’s Pumpkin Patch in 1983, and today the fall festival hosts over 60,000 guests and supports nearly 50 charitable organizations. In addition, Tracy leads Integrity Partners—a consultancy that includes marketing, communications, strategic planning, public speaking and leadership advisory services. Prior to Integrity Partners, she worked for the North Dakota Department of Commerce, serving in a variety of roles that allowed her team to help enhance the state’s economic development efforts and business climate. In 2015, Tracy co-authored the business book Wired Differently with Vern Dosch and Wally Goulet. The book is now being used as the textbook for a capstone course in the Gary Tharaldson School of Business at the University of Mary. Also in 2015, Tracy launched Papa’s Granola, a soft-n-chewy granola in multiple flavors. 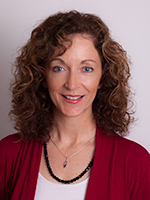 Outside of work, Tracy is an accredited business communicator with the International Association of Business Communicators and a member of PEO, an international women’s philanthropic educational organization. She is a founding member of the Bis-Man Food Co-op and once open, Papa’s Granola will be a producer for the co-op. Papa’s Pumpkin Patch is home for Tracy and her husband, Cory Finneman, two boxer dogs and two Quarter Horses. Their son, Ben-Luke, attends the University of North Dakota in Grand Forks. Colonel Jackie Huber was born and raised in Bismarck, ND, graduating from St. Mary’s Central High School in 1988. She received a Bachelor of Science Degree in Criminal Justice Studies from the University of North Dakota, and a Master Degree in Management with Human Resource concentration in 1999 from the University of Mary. COL Huber received the Senior Professional in Human Resources (SPHR) designation in May of 2011. COL Huber enlisted in the North Dakota Army National Guard in 1989. She deployed in 1990 with the 191st Military Police Company to Saudi Arabia for Operation Desert Shield/Storm. She was later commissioned as a 2nd Lieutenant in the North Dakota Army National Guard in 1992 from the Reserve Officer Training Corps (ROTC) program at the University of North Dakota. 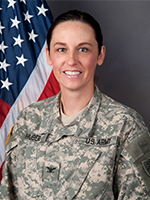 Her previous assignments include: Platoon Leader with the 191st Military Police Company, Public Affairs Officer/Detachment Commander of the 129th Mobile Public Affairs Detachment (MPAD), Headquarters and Headquarters Detachment (HHD) Commander of the 68th Troop Command, Counter Drug Coordinator, S1 for the 142 Engineer Battalion, State Family Program Director, Headquarters and Headquarters Detachment (HHD) Commander for the Joint Force Headquarters of the North Dakota National Guard, S3 and Executive Officer for the 68th Troop Command. COL Huber was the 1st Training Battalion (Engineer) of the 164 Regiment (RTI), the 164th Engineer Battalion Commander, J3/7 for the Joint Force Headquarters of the North Dakota National Guard, and is currently the Regiment Commander for the 164th Regional Training Institute (RTI). In 1997, COL Huber accepted a full time position with the North Dakota National Guard as an Intelligence Analyst with the agency’s Counter Drug Program. She was assigned as Plans and Operations Officer for the Director of State Military Operations from 1999-2004. She deployed with the 142nd Engineer Battalion as the Battalion’s Personnel Officer from January 2003 – May 2004, after which she became the State Family Program Director. In 2006, COL Huber was assigned to the North Dakota Guard Human Resource Office as the Active Guard & Reserve (AGR) Manager. She became the Director of Human Resources in 2007. COL Huber is currently serving as the National Guard Bureau’s Human Resources Advisory Council’s (HRAC) national chairperson. COL Huber’s awards and decorations include: the Bronze Star Medal, the Meritorious Service Medal with three Oak Leaf Clusters, the Army Commendation Medal, Army Achievement Medal, the Army Reserve Component Achievement Medal, the National Defense Service, the Southwest Asia Service Medal with 3 Bronze Stars, the Iraqi Campaign Medal with 2 Bronze Service Stars, the Global War on Terrorism Service Medal, the Armed Forces Reserve Medal with M Device, the Army Service Ribbon, the Overseas Service Ribbon, Kuwait Liberation Medal (Saudi Arabia), Kuwait Liberation Medal (Kuwait), the Meritorious Unit Award, National Guard Commendation Ribbon, the North Dakota National Guard Achievement Ribbon, the North Dakota National Guard Strength Management Ribbon, the North Dakota Army National Guard Emergency Service Ribbon, the North Dakota National Guard Service Ribbon, and the North Dakota National Guard Outstanding Unit Award. She is also a recipient of the Bronze Order of the de Fleury Medal from the United States Army Engineer Association. Her military education includes the Army Military Police Basic and Advance Officer Courses, Public Affairs Officer Course, Engineer Captains Career Course, Combined Arms and Services Staff School, and Command and Staff General College. COL Huber and her husband Lane currently reside in Bismarck, North Dakota. They have three children (Jacob, Joey, and Lola). Granddaughter of Charles and Anna Lidstrom who homesteaded south of Glen Ullin in 1887 when it was still Dakota Territory. Born in 1926, to Leonard and Crystal Sletmoen Lidstrom. Tractor driver and rattlesnake hunter, she graduated from Glen Ullin High School in 1944 and attended the University of Minnesota for three years. She married the new young lawyer in town, Bill Mills, lived in Washington D.C. and San Francisco. They returned to Bismarck and had four children. Betty graduated with honors from Mary College in 1967 with a degree in Social Work. She served on the Veterans Memorial Library Board, Bismarck City Planning Commission, North Dakota Educational Broadcasting Council, North Dakota Advisory Committee to the U. S. Civil Rights Commission, Supreme Court’s Public Trust and Confidence Implementation Committee, the North Dakota Legislative Compensation Committee, was charter member of the Bismarck League of Women Voters, and a participant in Alternative to Violence program at the North Dakota State Penitentiary. 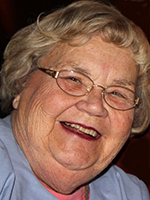 Betty is a founding member of the Bismarck Mandan Unitarian Universalist Fellowship, member of the Unitarian Universalist Prairie Star District Board, and served eight years as Trustee of the National Unitarian Universalist Association. She is a co-author of “Mind If I Differ?” published by Sheed and Ward in 1964, and was a weekly political columnist for the Bismarck Tribune for 25 years. She also co-authored with Sandi Tabor the 100 year history of the North Dakota State Bar Association. Betty was awarded Distinguished Alumni Award by Mary College, Lifetime Achievement Award by Prairie Star Unitarian Universalist District, and the Liberty Bell Award in 2011 by the State Bar Association of North Dakota. She loves to read, crossstitch, talk politics, and garden, and in her earlier life told fortunes at the Roosevelt School carnival. Amy Mossett is a nationally recognized scholar, cultural advisor, and interpreter on the history and culture of the Mandan and Hidatsa tribes of the Northern Plains. Mossett has shared various aspects of her research and cultural knowledge with audiences throughout the United States and abroad. Ms. Mossett has been interviewed for local, national, and international television and radio programs, documentary films, musical productions, books, educational journals, and other publications featuring Sacagawea, tribal perspectives on the Lewis & Clark expedition, Mandan/Hidatsa/Arikara traditional gardening, indigenous seed preservation, women’s roles in traditional and contemporary Mandan/Hidatsa culture, and other aspects of Northern Plains tribal history. She served as cultural expert and historian on the development of culturally relevant curriculum for museum exhibits and educational institutions. Ms. Mossett has over 25 years of successful administrative leadership experience with the Mandan Hidatsa Arikara Nation’s tribal government and its related entities. She has provided leadership on tribal, state, and national boards including the North Dakota Governor’s Culture and Heritage Committee and the National Council of the Lewis & Clark Bicentennial (NCLCB). 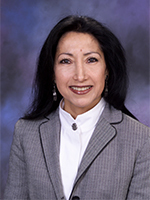 Mossett chaired the NCLCB Circle of Tribal Advisors advocating for historically accurate and culturally appropriate participation of tribes in the national commemoration of the Lewis & Clark bicentennial. She presented testimony to ND Legislative committees and to a United States Senate Treasury subcommittee on matters related to cultural resource protection, historic preservation, and cultural heritage tourism. Amy earned a Bachelor of Science degree from Minot State University and a Master’s degree in Education from the University of North Dakota. She completed her doctoral coursework in Educational Leadership with a cognate in American Indian Studies at UND. Throughout her career, Ms. Mossett has received numerous scholarships, fellowships, national honors and recognition for her work including the Eagle Award, presented to her by the National Guard Bureau for her work during the bicentennial commemoration. She was invited to the Nation’s Capitol on five occasions to participate in ceremonies and military events, honoring and celebrating the legacy of Sacagawea (Sakakawea). When Sacagawea was made an Honorary Sergeant in the United States Army, Amy accepted the citation from President Bill Clinton at a White House ceremony. Amy Mossett, a Mandan/Hidatsa member of the Three Affiliated Tribes, is self employed as a culture and history consultant and presenter. She lives and works in the badlands west of Twin Buttes, North Dakota. Amy loves hiking through the hills with her grandchildren and boating with her family out on the lake near the end of the Little Missouri River.